The students we refer to Jeff not only do well on the SAT and ACT, but also for the first time feel confident about taking these tests, and about their school work in general, and feel like everything is going to be OK. And that’s particularly true for our students with learning differences. Michael is currently working hard at Cornell and enjoying his exciting new experience. I have already given your name to a number of friends who have asked me who tutored Michael. You’re a great tutor, you have an intuitive feel for motivating and bringing out the best in young people. All the best, -Rick and Mary Beth L.
I just wanted to thank you again for the great job you did to help Casey prepare for her SAT’s. I don’t have to tell you how much stress these kids put on themselves to succeed, and the competition is fierce when it comes to getting into the college you really have your heart set on. Good grades are not enough, and each child needs an edge. I wanted you to know that your tutoring made all the difference in the world when it came to how she prepared for this important moment in her life. Instead of last-minute stress and cramming, Casey felt grounded and well prepared, and she was ready to face the challenge. The confidence factor alone is immeasurable and well worth the time and effort you invested in helping her get ready. Your skilled tutoring helped Casey keep the right frame of mind, and went a long way to prepare her mentally and emotionally, not just academically. This is truly an example of being well rounded, and what we as parents are looking for when we enlist a tutor for our child. It would be my greatest pleasure to recommend you to any individual or institution. I am so fortunate to have been referred to Jeff Bergman to be my son’s SAT tutor. Jeff immediately recognized that my son was exceptionally bright, knew most of the material on the SAT, and had the potential to score very high. However, he also discerned that what my son needed was intense focus and discipline while preparing for and taking the test, and he emphasized and worked on that. Jeff was encouraging, supportive and also related to my son in such a way that my son regarded Jeff with respect and credibility. Jeff was not only endlessly patient with my son, but also with me, as I would call him after every study session to discuss my son’s progress in these areas. During the past few months, my daughter has had the privilege of receiving SAT coaching from Mr. Jeff Bergman. Jeff’s reliability, professionalism, and knowledge regarding the psychology of learning are particularly notable. Indeed, I suspect that his ability to readily assess and to respond to my daughter’s psychosocial needs is indicative of his highly charitable nature, and it is why my daughter and I have developed such a fondness for him. His patient, encouraging manner, combined with his appropriately high expectations, helped to reassure my daughter, who lacked confidence regarding her abilities. His goals for her were based on his prudent observations of her performance during the coaching sessions, and his consultations with me validated that I had set realistic expectations for her achievement. 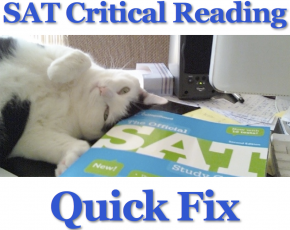 He prudently scheduled meeting times to optimize my daughter’s on-task behaviors, and he motivated her to take practice exams and to review SAT material between sessions (an accomplishment that I never achieved on my own). Jeff’s personal experience in a highly selective academic setting appeared to contribute further to his professional acumen. As a result of his prudent professional intervention, my daughter achieved her goals and what I believe represents her optimal performance – significantly above average scores on the SAT. I strongly recommend Mr. Bergman as a highly qualified SAT coach. I am writing to thank you for your wonderful tutorial with Mary Lynn in preparation for the SATs. Your knowledge and professionalism greatly impacted upon Mary Lynn’s successful test performance, and of equal importance was the confidence which you instilled in her. We are very grateful for you for your mentoring, which ultimately assisted in her admission to Columbia University. When we began the search for an SAT tutor, we were offered several references by friends and learning centers. The individual who referred you to us described you as a person who is extremely bright, relates well to young students, and has a great personality. She was accurate in her description of you. We feel fortunate to have met you, and would recommend you highly to others in pursuit of a tutor. Mary Lynn looked forward to the study sessions with you, and felt that you made the material fun and interesting. She also found your test-taking strategy techniques useful, in addition to your good advice regarding how to prepare in the final days and hours before the exam. You show sincere interest in your students, and also take the time to listen as they model their future goals. I am writing this letter to thank you for your services as my daughter’s SAT tutor. As you know, we were not interested in more conventional SAT tutors who focus primarily on strategy, but wanted tutoring that was geared to my daughter Lisa’s specific weaknesses. You helped her review material that she had learned in the past as well as reinforcing more recent knowledge. In doing so, you helped her to gain confidence in those areas in which she felt she needed to trust herself to make educated guesses on the test. You spent considerable time doing practice essays as well, which made the essay on the SAT much less intimidating. As a result, my daughter improved almost 200 points from her prior testing in just a few weeks of tutoring. Needless to say we are very happy with the results and wish to give you the credit you deserve in helping her to achieve them. I am writing this note to thank you for the outstanding job you did in preparing my daughter, Lauren, to take the SAT and ACT. She looked forward to her sessions with you and found them enjoyable and very productive. Your encouraging and thoughtful manner was extremely effective. After working with you, my daughter experienced a 250 point increase in her score. I have every intention of employing your services again when my younger son is old enough to start preparing for the SAT. I am sure he will enjoy the experience as much as my daughter did. I just wanted to drop you a note to thank you and compliment you on the results of Rachel’s SATs. As you know, Rachel had taken the SATs once before and not done as well as her grades and abilities would suggest. Working with you before taking the exam for a second time clearly made a huge difference; she brought her scores up by approximately 15 percent. Given that her initial scores were not bad, that was a dramatic increase, and reflects that you were able to help her prepare her both intellectually and emotionally for the exams. I know that Rachel felt good working with you, and she felt even better about herself after she got her exam results. As a parent, that is all I can ask for. Thank you again. I am sure we will be back in touch with you when it comes time for our son to sit for his exams. I would like to take this opportunity to thank Jeff Bergman for his dedication, knowledge, and consistent encouragement while tutoring our daughter Loni for the SAT. It was always a pleasure and a privilege working with Jeff. Jeff’s kind and supportive approach inspired Loni to feel confident and well prepared for the SAT, and his positive attitude helped relieve our anxiety as parents, as we were confident that Loni was prepared and confident when it came time to take the tests. In the end, thanks to Jeff’s excellent approach to teaching the material, Loni improved tremendously and she was very pleased with the end results. I highly recommend Jeff Bergman as a professional and qualified tutor. Jeff is sincerely concerned about his students and demonstrates an honest desire to help his students improve. Aside from his professional manner, he is friendly, upbeat, and always a pleasure to be with. As parents, we feel strongly that any student will feel confident, optimistic and positive while working with Jeff. Please accept this letter as testimony to Jeff Bergman’s success as an SAT tutor. Although a good student, my son was never pleased with his standardized testing scores and feared that the SAT would jeopardize his chances of being accepted to a top university. Diligently working with Jeff along with compliance with Jeff’s methods resulted in my son’s achieving an over 500 point improvement from his first PSAT score. Jeff’s calm, non-alarmist attitude coupled with his well planned lessons allowed my son to not only practice for the exam, but more importantly to achieve the self-confidence needed to overcome his fears. The result was a solid SAT score and the motivation to apply to the most competitive universities. Thank you for the excellent preparation you have given Max. His scores were: Critical reading – 740, Math – 670, Writing – 640. That’s a 300 point increase from his PSAT. I’m really pleased with the results. I know Max enjoyed working with you. I am writing to recommend Mr. Jeff Bergman as an SAT tutor. I was referred to him by one of Oakwood High School’s counselors, who was very impressed with him. I concur and found Jeff to be quite knowledgeable, professional, flexible and personable. These were critical attributes with regard to tutoring my sons. My older son raised his scores by over 300 points, and my younger son went up 250. Chloe is at UCSC which is where she had wanted to go since her freshman year in High School. A big thanks to you for helping get her SAT scores where they needed to be. She is a film/new media major and a starter on the varsity tennis team. She couldn’t be happier.